Posted by @jennyjenjen in Pre-Departure, Travel. 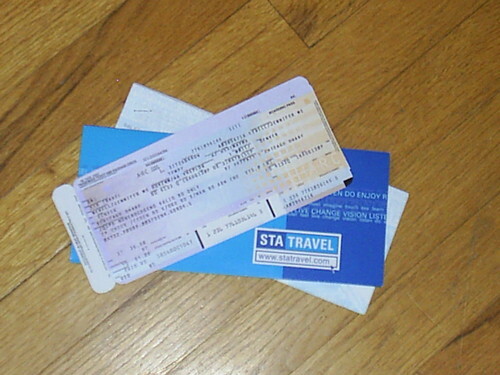 Or rather, my tickets – I have a few stopovers before I get there! This makes the wait to go to Sweden just more excruciating. The tickets have a special place on my wall, where I look at them every day. It’s going to be quite the exciting journey. I can already see myself in the airport, with my bags packed and tickets in hand, ready to take off. O’Hare Airport in Chicago is my first destination, with a very short layover before I fly to Manchester, then I’ve got another short layover and finally I’ll be in at Arlanda Airport in Stockholm. I’ve been to O’Hare before; I’ve flown in and out of there a few times, visiting family and heading to other destinations on the East Coast. It’s too bad that my layover is not longer so I could visit family, but it’s possible that I could have a late lunch with someone in the terminal. I usually fly into Midway, though, which sometimes feels like the Omaha of all airports. O’Hare is not that bad of an airport, but I like all airports, mostly just for the feeling I get when I know I’m travelling. To me, there are few things as exciting as travel. Posted by @jennyjenjen in Helpful Hints, Pre-Departure, Travel. I’ve purchased my ticket for Sweden through STA Travel. I got quite the deal; the ticket cost $614 (one-way) and I will stop over in Chicago at O’Hare and in Manchester, UK. I depart on 16 August. Although I searched for tickets myself online, STA Travel did a great job. We have a location in the UMC and some very friendly people work there. I had always been doubtful of the place but now I’m confident that they are a good resource to have around. It’s incredibly exciting to finally have my plane ticket. Now I can take my flight information to the Study Abroad office and turn in my housing form as well.